Is there a chocolate spread more delicious than Nutella!? No, I don’t think so. There’s just something extra special about Nutella’s creamy combination of chocolate and hazelnut that spreads so easily on just about anything. Not too long ago I created a list of Awesome Nutella Recipes from around the web that took the chocolate hazelnut goodness to the next level. 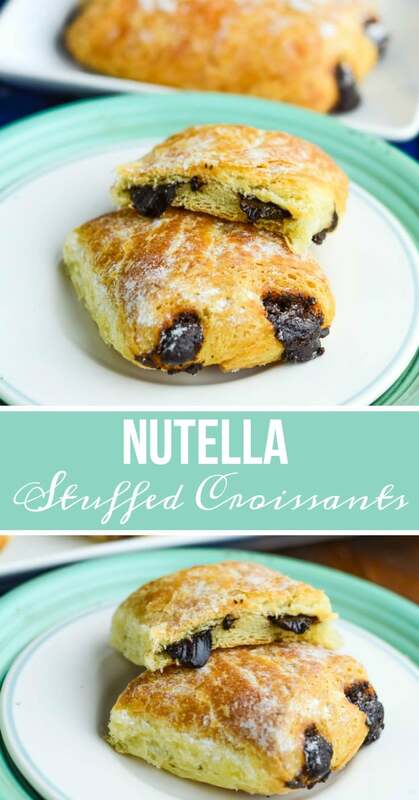 I had to update that list when I made these Nutella Stuffed Croissants … AKA Nutella Stuffed Crescent Rolls. The beauty of this recipe is that it’s so simple to make, you only need two ingredients— well, three if you count a bit of powdered sugar for dusting, but that’s completely optional (and a totally recommended extra step!). 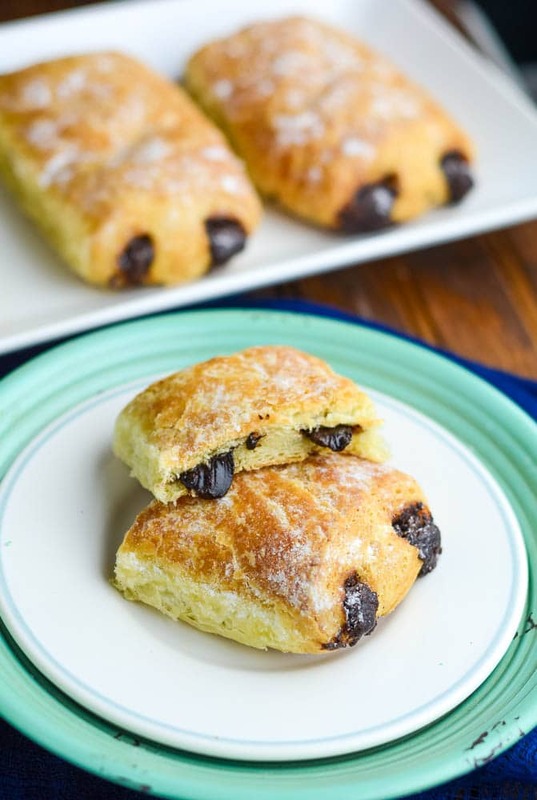 The shape of these Nutella Stuffed Croissants is a little different than the classic crescent roll. Though you use the same dough, you’ll use two dough triangles to form a rectangle, which is a larger portion size, allowing you to stuff the crescent with double the Nutella. To achieve this, spread two rows of Nutella down the middle of the dough and then fold over the edges like a packet. Once baked, the croissants will puff up into bars of flaky, gooey, chocolate-hazelnut yumminess. In addition to Nutella, you could add sliced bananas, strawberries, different flavors of jam, peanut butter or even marshmallows to the croissants for an even more indulgent breakfast or dessert. The possibilities are almost endless! Open crescent dough package and seam two triangles together, forming a rectangle. Spread Nutella in two rows lengthwise. Fold croissant dough edges over the Nutella strips towards the center, meeting in the middle. Bake for 10-12 minutes or until golden brown. Remove from oven and dust with powdered sugar.